I was fortunate to be a part of a 20-person building tour of 3 World Trade Center, arranged by BOMA New York. Arriving at the World Trade Center Transportation Hub’s Oculus is like entering a new world of urban luxury. The largess is jaw-dropping and equally remarkable is the seamless flow of people. The multilayers of marvel engineering are nothing short of impressive, which immediately set the tone for an inside look at the 80-story, 1079 foot skyscraper on Greenwich Street. 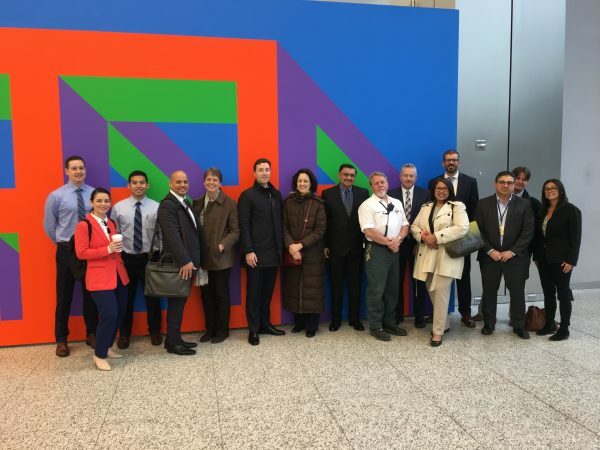 The high-level tour of 3WTC was provided by Steve Nathan, Chief Building Engineer for Silverstein Properties – and the winner of the 2019 BOMA NY TOBY Award, “Chief Building Engineer of the Year”. He greeted us with white glove treatment, a Silverstein signature. Having worked with Mr. Silverstein for more than three decades, Steve opened with a similar sense of humor, “I’ve been working for Silverstein Properties for 35-years. I started when I was five.” After a quick laugh, it was all business for the balance of the tour. 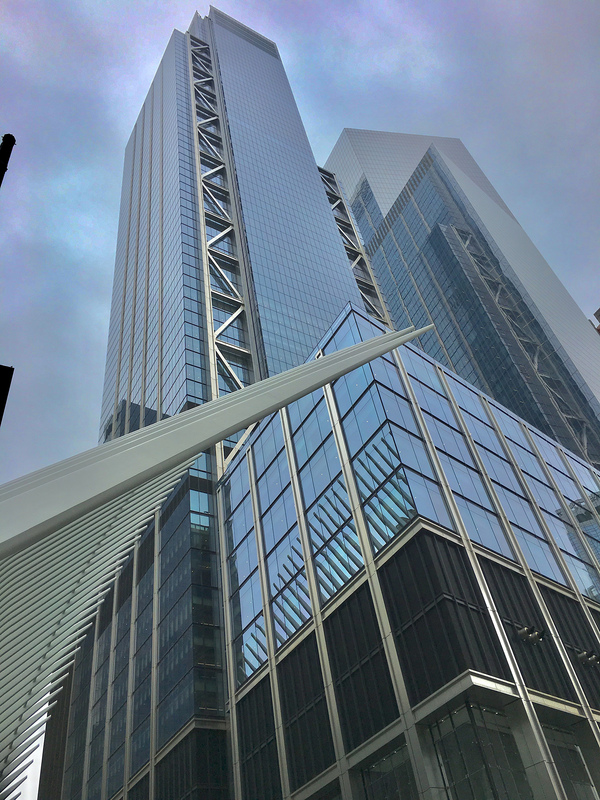 Mr. Nathan opened 3WTC in June 2018, which followed the opening of 7WTC and 4WTC. He explained that when they rebuilt 7WTC, the mission was to deliver the greenest and safest building in the world. They achieved the objective, which set a standard for both 4WTC and 3WTC. While our group was standing in the soaring lobby of 3WTC, Steve pointed outside its 9/11 Memorial facing entrance and highlighted that all three buildings (3, 4 & 7) were designed by different architects, providing downtown with a unique experience and diverse mix of architecture. 3WTC was designed by Rogers Stirk Harbour + Partners, with intent to showcase the building’s infrastructure, thereby revealing its iconic “K” brace. In route to the elevators, Steve identified the retail annex that will open soon, providing direct access to the Oculus. We rode the elevator direct to the available 68th floor and were greeted by an open floorplate of 42,000 square feet and expansive views in all directions. After spending 10-minutes capturing multiple postcard views on my iPhone, Steve corralled the group to the building’s core. There, he pointed to the two-foot thick shear wall, describing how rigid and safe the core is within 3WTC. He specified that even the fireproofing they used is a protective coating that is so thick, it would need to be chiseled off. With the exposed ceiling, Mr. Nathan pointed to a neutral host cellular system installed by Verizon, as well as a dedicated first responder communication system. Beyond the two feet of pumped concrete is a stairwell that’s 20% wider than the required code, with a quadruple redundant lighting system and an LED Message Board directing people during a possible evacuation. Every stairway was outfitted by a standpipe sprinkler riser, alternating the feed to every other floor. Taking steps further within the stairways, the engineering team installed an Automatic Breach Control valve on every floor. The ABC valve accommodates various flow rates and when it hits a certain pressure, the valve automatically closes on that floor, with available water flow on the floors above and below. After a few questions, we were escorted down to a mechanical floor. On the way down to the 18th floor, inside a 20-foot high freight elevator, Mr. Nathan conveyed that the building is supplied with fresh air from the roof and the 19th floor of the building, describing that the building’s air is cleaned and processed via a two-stage, three-filter system. 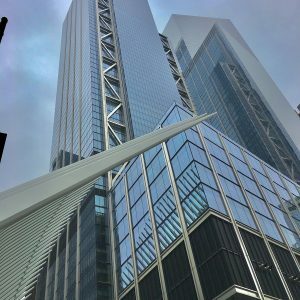 As we walked through the spotless mechanical floor, Steve reviewed the building’s power specs, detailing that between 3WTC and 4WTC, there are twelve spot networks, with eight feeders in 3WTC. In route back down to the lobby, we got a peak of The Skydeck on the 17th floor – one of three setbacks utilized as an outdoor garden. The Skydeck is available to all building tenants, while the outdoor spaces on the 60th and 76th floors are exclusively controlled by their respective tenants. Mr. Nathan touched upon some life safety infrastructure unique to the LEED Gold certified property, as well as the building’s three-fuel cell cogeneration plant, BMS redundancy and flood mitigation system. Steve concluded with a forward thinking anecdote. He told us that as the construction and engineering teams were developing the new buildings downtown, Carlos Valverde, a Silverstein executive working on the building, came across a NASA website called – “Lessons Learned” – which is a database from qualified contributors across many organizations, used by thousands of professionals for a multitude of disciplines including science, engineering, education, manufacturing and project management. Impressed by NASA’s open source data and inspired to share their own information, Silverstein Properties is actively cultivating its own Lessons Learned for Class-A development.